For the ultimate family vacation in Dubai select the family rooms at Novotel World Trade Centre. With comfortable beds and spacious interiors, it is the ideal choice for families with 1 or 2 kids. 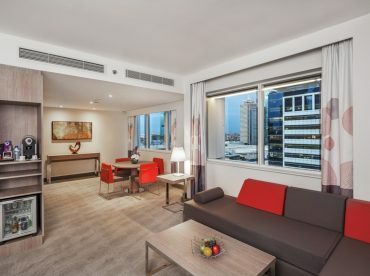 Don’t forget at Novotel World Trade Centre, 2 kids below 16 stay free of charge when sharing the parents room. If you still need more space we give 50% off on the second room for children! Enjoy large beds, complimentary Wi-Fi and a contemporary bathroom stocked with fair-trade products. For your entertainment, the flat-screen TV has over 70 international channels. The kids play area at the lobby is equipped with xBox gaming consoles, books and toys.